Underground, Overground by Andrew Martin is subtitled “A Passenger’s History of the Tube”. 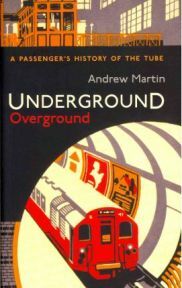 Since he was young, Martin has been fascinated by the tube, and this is his attempt to tell its history, not from the historian’s point of view, but as a passenger. Since I moved to London, I’ve developed an interest in the tube. I have read about it, but I’m not that interested in the technical or engineering side of its history. I am interested in the social history of the underground, of how it contributed to London’s growth and made it into the city it is today. From this point of view, Martin’s book seemed ideal for a reader like me. The first underground line was the Metropolitan, and it brought a wave of other sub-surface lines with it – those are the lines which are literally just below the surface, such as the aforementioned Metropolitan or District, not the deep tubes like the Central or Piccadilly lines. The deep tubes soon followed however, and with the underground network growing and flourishing, people were able to work further from their homes and travel there cheaply. It brought about residential growth, most famously “Metroland” along the Metropolitan line. London now is unimaginable without the underground, despite all the complaints about the service and the overcrowding, and indeed London would not exist as we know it without the underground. Martin is not an engineer, but a journalist with an interest in the underground. He wrote a transport column for the Evening Standard, and through that seems to have made many contacts within Transport for London. In Underground Overground, he tells the full history of the underground, but in a friendly and accessible manner, keeping it light on technical details and light in tone. This is not a book by an historian: you may find many of the same interesting facts or amusing stories you would read in, say, Christian Wolmar’s The Subterranean Railway, but Martin’s interest is mainly in the social history rather than the railway history. His tone is light and often wry; he shares amusing anecdotes and is frequently ironic in his attitude. He may mock the underground and its less-than-straightforward history, but it is with affection, and it is clear that he really does enjoy the underground. He explains in his introduction that for him, a tube journey is something to be enjoyed in and of itself, it is not merely a way of getting from A to B. This is something I can understand, having done the same myself. The subtitle of “A Passenger’s History of the Tube” had led me to expect a work which was full of passenger’s observations through the years, but this was a misapprehension. The passenger is Martin himself, a tube passenger with more than a passing interest in its history. Underground, Overground is a thoroughly enjoyable book, and one which all Londoners should read – how often have you travelled by tube but never thought about how that tube came to be there? There is so much history in something we take for granted every day, and Martin reveals that history in a book which is highly readable and full of humour. Many thanks to Profile Books for providing a review copy of Underground, Overground. No Comments on "Underground, Overground"